Jeff Koons / Andy Warhol Flowers. Gagosian Gallery, New York, New York [November 11 - December 21, 2002] pp. 5 (installation view, partial), 28-29 (installation view), 30, illustrated in color. Basualdo, Carlos and Ana Mecugni, ed. Embracing the Contemporary: The Keith L. and Katherine Sachs Collection. Philadelphia: Philadelphia Museum of Art, 2016, p. 165. Galerie Max Hetzler. Remember Everything – 40 Years Galerie Max Hetzler. Berlin: Galerie Max Hetzler, 2014, pg. 118. Holzwarth, Hans Werner, ed. Jeff Koons. Cologne, 2008, p. 360, illustrated in color. 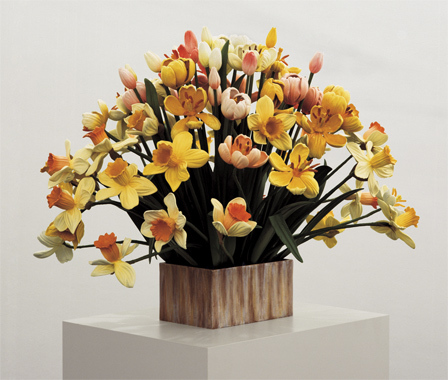 Jeff Koons / Andy Warhol: Flowers. Exh. cat., New York: Gagosian Gallery, 2002, pp. 5, 29, 31. Zeitsprunge: Kunstlerische Positionen der 80er Jahre. Exh. cat., Ludwigshafen am Rhein: Wilhelm-Hack-Museum, 1993, p. 51, illustrated. Muthesius, Angelika, ed. Jeff Koons. Cologne, 1992, pp. 144, 156-157 (installation view, partial), illustrated in color. Muthesius, Angelika and Burkhard Riemschneide, eds. Erotik in der Kunst. Cologne, 1992, p. 127, illustrated in color (installation view).